One year ago, in the heat of Mombasa, Kenenisa Bekele's reign as undisputed champion of the country was ended. It was to be a brief one-year interruption, as he yesterday confirmed that he is without doubt, the greatest cross country runner of this generation, and arguably, the greatest ever. Paul Tergat and John Ngugi won the title 5 times, Bekele now has a sixth race. But even that is misleading for five of those titles were coupled with a title in the short race, discontinued from last year. So that makes him an eleven time champion! Zersenay Tadese, the man who dethroned Bekele a year ago (along with the conditions), ran the only race he could. We wrote on Saturday that he'd have to be aggressive, and push the pace as high as possible. And he did exactly that. I was amazed at how aggressively he was running, surging three or four times each lap (2km long), with noticeable changes in pace every time. But every single surge was tracked, answered with ease by Bekele. And eventually, with one final 2km lap to go, Bekele eased into the lead, and moved away. The move was decisive, opening up a gap of perhaps 15 m within the first minute of the final loop around Holyrood Park. 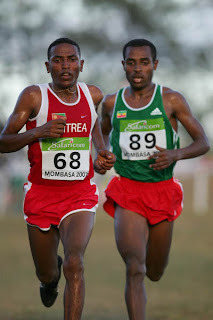 It remained that large, the jostling between Tadese and two Kenyans going on behind Bekele's untouchable performance. Bekele stands apart from the rest of the world when running on the country. He does, if this is possible, look different to any of the runners he has beaten in the past seven years - they run ON the mud and hills, he runs OVER them. Late last year, a great deal was made of Zersenay Tadese's running economy, the highest ever, it was reported. I'm not sure that Bekele's is much different, but I would put forward that what Bekele enjoys is an enormous advantage in neuromuscular performance. By that, I refer to the timing of muscle contractions, his co-ordination and ability of his muscle to store and release elastic energy when he moves from the landing to the push off phase of the running stride. There is a growing body of evidence that a good deal of the East African advantage comes from this neuromuscular advantage, their ability to maximize the energy returns of what is called the stretch-shortening cycle. For example, it's been shown that African runners have a higher level of what is called preactivation than Caucasian runners. What this means is that their muscle is active BEFORE the foot hits the ground, and that this stores energy that can be used on push off. I am sure that this advantage is one of the key reasons they are dominant. And in turn, I believe it is one reason Bekele is so dominant over the country. It always fascinates me to watch these world-class races because they showcase the very best against the second level, and the difference is clear. What is perhaps most remarkable, is that physiology does not yet know what this difference is! We can guess and speculate, as I'm doing, but no one knows for sure why one athlete finishes in 40th place (for example, Craig Mottram, who was in 31st), and another wins easily! All the laboratory research in the world will not pick up that difference...all the "usual suspects" like VO2max, heart, lungs, economy etc. don't explain a 2 minute performance difference. And so running science has much to learn...until then, it can only admire the difference that makes Bekele so remarkable. The only time Bekele ever dropped off the pace, and made this such a remarkable performance, was when he lost his shoe at the 2km point! Up to that point, Bekele had been running comfortably at the front, while the race sorted itself out. Approaching a right hand turn, he was caught on the heel by the runner behing, causing his shoe to slip partially off. He stopped at the bend, pulled it back on, and then resumed the chase. He lost perhaps 15 seconds as a result, but over the course of the next few kilometers, reeled in the lead group, and the race resumed normal order. Zersenay Tadese was gallant in defeat. In the end, he simply did not have the speed nor the strength to drop Bekele, or the challenge of two Kenyans that few expected would feature. But it was not for a lack of trying and one certainly cannot accuse him of giving up the title easily, or failing to deliver a proud defence. As mentioned, he was aggressive, proactive and set the race up. His surges blew off the main challengers from Uganda, Ethiopi and Kenya, and in the end, it was Bekele and two relatively unheralded Kenyans who matched his pace. Tadese worked so hard that in the end, it's almost a shame he "only" managed bronze, being pipped to the line by Leonard Komon of Kenya. He was proud of his race, however, and has at least seen first hand how hard he'll have to work come Beijing if he's going to claim anything more than this bronze! I still believe his real moment in the limelight will come in the marathon some day. Leonard Komon had only finished 7th at the Kenyan trials, and was the last person anyone expected to challenge the big two. He now has a World Championship silver medal in his pocket, as in the end, he held onto Tadese's surges, and then eventually, was the man most able to push on when Bekele made his decisive move over the final 2km. His second place, at the age of only 20, will however be scant consolation to the Kenyans, who lost all four races. Similarly, they may have bagged the Men's Team Title (helped by Joseph Ebuya, the other unheralded Kenyan), but they have been made to realise just how much work needs to be done to get back to the top step of the podium. One other notable from the race was Craig Mottram, the Australian who always enters these races with the tag of "Favourite to challenge the East Africans". Which is to say, he's the best European/white athlete around. But he found the African heat in Scotland a little uncomfortable in this race, eventually finishing down in 31st position, a full 2:02 down on the winner. To his credit, he stuck it out and finished, but for him, it's back to the tartan tracks and hopefully a more successful outdoor season. Last year at the Osaka World Championships, and then before that in Athens, the top step of the 10,000m races was occupied by one Kenenisa Bekele in the men's races, and Turinesh Dibaba in the women's races. And in Edinburgh, Dibaba did her part to ensure the same would happen for the World Cross Country title. It was however, not the same orthodox race that Bekele delivered (barring the loss of the shoe - hardly orthodox). For in this one, Dibaba was never present at the front of the field, always hanging back in about 6th or 7th place, and even dropping off the pace that was set by her country-woman, Gelete Burka. It was Burka and another Ethiopian, Mestawet Tufa, who took the lead about 2km from the finish (as with Bekele - perhaps a pre-meditated plan) and surged very hard. A big group of women was almost instantly stretched out, with three athletes at the front, and Dibaba caught in the middle. The big move came on what was called Haggis hill, a brutal, though short climb towards the end of each loop. Burka, the short course champion two years ago, attacked on the hill, and only Tufa and Linet Masai, an 18-year old Kenyan, could go with her. She pushed on, opening up about 5 m on Tufa, who in turn had 5 m on Masai. Dibaba responded somewhat sluggishly to the initial move, and was at that stage about 4 or 5 seconds off the leaders, but held this gap for the rest of the lap, until just before the very last ascent of Haggis hill. Leading into this, with about 1km to run, Burka seemed to tire, and the group of three came back together. A few seconds later, Dibaba bridged the gap, and was then in a position to take advantage of her incredible kick. They climbed the hill for the last time, and Dibaba suddenly appeared to discover the famous Ethiopian finish, and she moved clear of Tufa to take the tape by a clear 5 second margin. Burka, for all her hard work earlier in the lap, dropped back to finish in 6th, clutching her stomach as she crossed the line. Kenyan running woes - too much "good", not enough "Great"? Third was taken by Masai, and again, the Kenyans will be encouraged that they managed to get a 18 year old onto the podium. Having said that, I have lost count of how many times a junior from Kenya has done well in the senior race, only to disappear into anonymity within the next year or two. Certainly, a lack of talent is not the problem in Kenya, but the management of their "assets" seems to pose a problem. Perhaps they are spoiled for riches, and don't feel the need to nurture this young talent, but it's uncanny how many times they unearth a teenager (or 20-year old as in the men's race), who is good but just fails to take the next step into the Dibaba/Bekele stratosphere. So problems for Kenya then, but none for Ethiopia, who picked up the Junior titles as well, and have sights firmly set on taking all four long distance track golds in Beijing as well. So that's the race summary - apologies again for the delay and late race report, but perhaps some will have missed the results so far. For those in South Africa, I imagine this is likely, given the prestige placed by Supersport on this event. Not only did the rest of Africa get the broadcast a day before we did, but we were then subjected to the commentary of Jean Verster and colleague whose name I did not get. The two repeatedly gave us world class insight by assuring us that the pace was very fast (at least twice a lap). Quote of the day goes to Jean Verster, who, after Bekele had won the race, informed us all that "if he had not been spiked [after 2km, remember], he would have run away from this field much earlier and won by an even bigger margin". Enough said. Sadly, the quality of the TV coverage is symptomatic of the quality of athletics in South Africa, who managed to get its best athlete into 45th position. Athletics South Africa should be ashamed of themselves for such disgraceful management of the sport. How South Africa cannot produce athletes capable of top-20 finishes is an act of glorius incompetence. Any chance Supersport would be willing to do their bit and try to uplift the quality by providing anything other than second level coverage? And that is also my contribution to April Fool's day, which is tomorrow! ASA and Supersport commentary, take a bow! We'll be back with a look at footstrike patterns of elite runners! The 154th boat race took place yesterday, and it was Oxford who enjoyed a comfortable win. I mistakenly reported that Cambridge were favourites (based on bookmaker odds I had seen - presumably a hive of Cambridge patriotism skewing the odds), but Oxford were really the favourite boat (heavier, more experienced, more pedigree - including the oldest ever rower in Boat Race history at 36 - Mike Wherley of the USA). The race itself would make fascinating physiological analysis; I wish rowers could, in real time, monitor power output and efficiency, for the Boat Race would throw up some fascinating information, because of the bends in the River Thames, the importance of the inside line dictates tactics, such that teams are "forced" to throw in supra-maximal efforts to grab it and defend their water. Oxford got the better start, but only marginally. They had the inside line, but the key was to take the lead at the Surrey bend. So Cambridge worked incredibly hard to keep Oxford from getting a full boat length lead, to "keep their water". Cambridge managed to do this, and actually grabbed the lead (by 1 second) at the Hammersmith Bridge. 80% of boats leading at this landmark win the race, but not yesterday. As soon as the Surrey bend had unwound, Oxford retook the lead, and this time, opened it up and soon it became insurmountable. So the "stochastic" nature of the event would make for fascinating data, and I'd love to see data on the physiology of the Boat Race. If anyone has access to that, do let us know, I think it would make a great post or two! As for rowing, there's definitely a lot to write in this Olympic year. 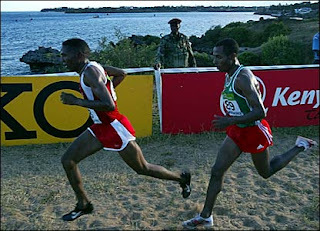 In 2007, in oppressive heat and humidity in Mombasa, Bekele, the greatest X-country runner in history (according to titles), was dethroned amidst a cauldron of thousands of Kenyans who reserved the biggest cheer of the day for when they heard the news that Bekele, so often the conqueror of their athletes, had dropped out of the race. His DNF left the way open for Zersenay Tadese of Eritrea to claim the title - it was the first time since 2002 that anyone other than Bekele had stood atop the victory podium at a World X-country race. Since then, the two have raced each other, so it's probably not entirely accurate to call this the long awaited rematch. First, Bekele defended his 10,000m title in Osaka, though he was pushed all the way by his team-mate, Sileshi Sihine. Tadese was disappointing in that race, finishing only 4th. And then about 2 months ago, Bekele and Tadese met over the country. That race was also in Ediburgh, over the same terrain as tomorrow's race will be. And it is this race that gives the strongest indication of the likely result come Sunday afternoon. For on that day, it was Bekele who triumphed, by a slender margin of 1 second, though it did appear that he had something in reserve. Tadese, for his part, has been a little up and down since Mombasa last year. There was the disappointing performance in Osaka, but that was followed up by a dominant performance in the World Half Marathon championships. Tadese is one of my favourite runners - he got a lot of coverage here last year when results were released suggesting that he might be the most economical runner ever tested. His use of oxygen was a remarkable 150ml/kg/km, compared to the "usual" value which is closer to 200ml/kg/km. The race in Beijing later this year, where heat and humidity are likely to factor in, may be a great race if he arrives on form. This year, he was beaten by Bekele in Ediburgh, and then just over a week later, beaten by a young Ugandan, who is also a name to look out for tomorrow - Moses Kipsiro. In recent years, Uganda has finally begun to dip into the talent pool it clearly has. If you look on a map of East Africa, you'll see that Uganda, Kenya and Ethiopia all converge in a tiny triangle where many of the great athletes of the past have emerged from. If genes play a role (which I think most will acknowledge they surely do), then Uganda could well produce many more athletes like Kipsiro, and his comptratiot Boniface Kiprop, in future years. But back to Tadese, he's clearly got the credentials to push Bekele, but whether that is enough to win what is one of the most competitive races in the world, remains to be seen. A lot will depend on Tadese's tactics, and also how the Kenyans and Ugandans get involved in the skirmish at the front. As for tactics, in last year's 10,000m final, it was Martin Mathati of Kenya who set the race up by attacking Bekele and Sihine with three laps remaining. That move actually created gaps between himself, Sihine and Bekele. Bekele was, for a brief moment, hanging on. At one point, Mathati gestured to Sihine to come past and help with the pace setting. Sihine did not respond, and Bekele was able to hang on in third, until the final lap. The bell came soon enough, and a 55-second final lap gave him a victory that appeared more comfortable than it really was. And had Mathati or Sihine been able to lift the pace even slightly more, those gaps may have become too large to claw back, even with Bekele's huge kick ability. So on Sunday in Edinburgh, if I were the coach of the Kenyan team I would be sending "domestiques" (to borrow a cycling term) out to the front from the start to keep the pace high. It's difficult to know what kind of shape Bekele has - he's done an 8km cross-country race, and an indoor 2-mile race where he broke the world record - again, the speed is no problem. If there is any chance that he is "thin" on distance work and endurance, then the only way to exploit it is to force him to run fast for long. Of course, the problem is, the high pace is just as likely to favour Bekele - he is after all the world record holder, so no one can run faster for longer than him! However, this tactic is really all the Kenyans have - they surely cannot hope to survive at the back of the race when Bekele kicks. All the while, Tadese will enjoy the fast pace. His asset is without doubt endurance and strength - the 21km runner coming down in distance. Bekele, on the other hand, while a great distance runner, has seemed to focus much more on speed in recent times. He had something of a bizarre year in 2007 - after his loss in Mombasa, he spoke of having "lost all his strength". He then returned to the track and raced ONLY 3000m, setting new PBs and winning easily. After the 10,000m in Osaka, he tried and failed for a 10,000m record, where he really did seem to be below par. And then he promptly ran more PBs at 1500 and 3000m, pointing again to an emphasis on shorter, faster training. So his strategy seems to have been to go shorter. I'm not sure whether that is in response to his failure in Mombasa, or whether it was done for variety. The result of this, however, is that none of the other athletes in Sunday's race can afford to let the pace drift at all, for if they are together with less than 1km to go, and the pace has been anything but high, Bekele will win comfortably. The best race for the likes of Tadese is if the Kenyans take up the pace, keep it high, and then he can attack off that fast pace, with perhaps 2km to go. I still think he'll end up second best to Bekele, but this is really his only chance of defending. Gideon Ngatuny, Kenya's biggest hope. He'll finish with Kipsiro. Sileshi Sihine, who hasn't raced a great deal this year, and may well be more focused on the Olympic Games and his efforts to add a gold to his amazing collection of silvers. And then one last prediction - Craig Mottram, of Australia, will be racing on Sunday, and much hype is made whenever he runs, because he's probably the only non-African (excluding the legion of "Qataris") who is a challenger in this big races. His best World X-Country finish is 13th, and the reality is that he is likely to fighting out for about that position again. Maybe, on a great day, he'll slip into the top 10. But if the race is attritional and aggressive from the start, he'll be just outside. So those are my picks - come Monday, we'll see how many are correct! P.S. Another big event this weekend is the Oxford-Cambridge Boat race, where the Oxford (dark) blues take on the Cambridge (light) blues for the 154th time! The first ever race was held in 1829, and with a few interruptions due to Wars, has become on the big events on the annual calendar. 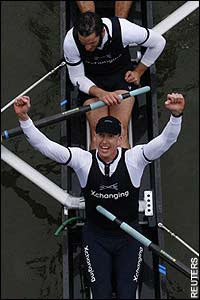 Cambridge are the defending champions, and this year, are favoured to win again, despite having a lighter crew. One interesting aside is that the bookmakers are giving pretty good odds for a boat to sink, courtesy the weather! Hopefully that does not happen, and the race is more like the 2003 event, where Oxford edged it by one foot, in the closest winning margin ever. There was once a dead heat, but that was in 1877, when photo-finishes didn't exist! You can read more about the fascinating history of the race at the Official race site. Rowing is not a sport we've covered much here, primarily because it's under-researched, particularly here in South Africa. However, this being an Olympic year, rowing will certainly merit a few posts! Welcome to the Science of Sport! and comment of the swimming and other events at Beijing 2008! Yesterday, towards the end of the post, I mentioned that we'd leave the Speedo Swimsuit issue for a while, and pick it up again in a few weeks when the sport's governing body, FINA, meets with Speedo and other manufacturers to discuss the issue of new swimsuits. However, I received some interesting new information on the topic, so I thought I'd do a very short post on that, and then leave the footstrike one to tomorrow morning (SA time) instead. For those who've missed the story, in the last 39 days, 14 world records have been set in the pool, and 13 of them have been in the newly designed swimsuit by Speedo. Claims of 5% less drag, water repellant fabric, an "internal core stabilizer" which helps the swimmer maintain form towards the end of the race, and what are called "low-drag" panels where the flow of water is greatest have been made to explain what must be one of the more remarkable periods of record setting in the sport. Are there any swimming enthusiasts who know of similar periods where so many world records have been set in so short a time? In any event, all these innovations add up to more efficient movement through the water. And this, of course, is the critical aspect in swimming, as has been discussed in the comments section to previous posts on the topic. Earlier today, I received an article from Jim Ferstle, a journalist in the States who seems to be something of a "Maven" (read "The Tipping Point" by Malcolm Gladwell for the explanation!) when it comes to these stories. You can read that article here. Wind tunnel testing at NASA to evaluate drag and stability in more than 60 candidate fabrics, including at a "microscopic" level. What is more interesting, however is that during the development, Speedo apparently met with FINA and adhered to all the regulations for swim-suit design. If that is true, there is little chance of any action being taken now (not that there ever was), but it's interesting to note that many people within the sport (including FINA, amazingly!) are now raising concerns, when FINA (apparently) approved the development. One should not read too much into things, but this doesn't suggest equal access for all swimmers, federations and officials, either to information or to the actual swimsuit. For if FINA officials are now questioning the legality of the suit, then what process was followed to approve it to begin with? Clearly, they missed certain aspects which are only now being questioned - given the extent of the testing done, one would have thought that issues like buoyancy (which seems to be the big issue now) would have been resolved? Is access to equipment going to be a problem? "The only thing we don't want to be is to be feeling like we're being treated any less fairly than any of the countries in the world that have access to this suit," said Johnson. "But we were told that the suit wasn't available. The question now is: If it's not available, how come everybody has it?" In their defence, Speedo Canada have said that they did not wish to have a situation where certain swimmers at the upcoming Canadian trials had the suit, but not others. That's fine, but those swimmers might well be asking why they are receiving suits months after rivals in Europe and Australia, having to settle instead for a few trial suits? All this does not do much for the fear that the suit will divide the swimming world into "the haves" and the "have nots". This is a quote by Kieren Perkins, former 1500m legend and Olympic champion, which you can read the article described above. No sooner than this concern was raised, and another big player on the swimming stage entered the fray. 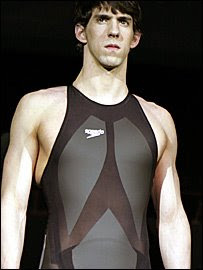 I mentioned earlier that 14 records had been set, 13 of them in the Speedo LZR Racer. Well, the single record NOT set in the Speedo was set yesterday evening by Italy's Federica Pellegrini. She was wearing Arena's new swimsuit - the Powerskin R-Evolution. The name says it all, I guess! This is definitely a good thing - at least the competition in the market will achieve the goal of getting the best swimmers into SIMILAR suits. The playing field may yet be level, but only at the top end with the elite swimmers. The worst thing that could have happened is that Speedo was the only company innovating, and then nations with other sponsors would be handicapped from the start. Nike and Adidas are to launch their product soon, so there is hope yet for an "even" Olympic Final. So it certainly seems we're heading for a technological battle come Beijing. Every second weekend, for six months of the year, I follow a sport where the technological battles rage and winning and losing is often a function of tyre choice, never mind the other $400 million dollars that goes into technological advancements - it's called Formula 1. Not to take anything away from the drivers, but with so much of the battle won OFF the track, the sport has a very different character/personality than swimming and running, where it's one athlete against another. Is swimming headed that way? One thing is for sure, I would hate to be the only guy in the Olympic Final not wearing a Powerskin or an LZR with "internal core stabliser" functions! "Schipper had started like a speedboat to be 1.34 seconds under world record pace at the 100m mark with an opening split of 58.77s. But she finished like a submarine to clock 2mins:06.82secs and finish over a second off her best (2:05.40)". I'm not sure whether the "speed boat" first half is more a concern than the "submarine" second, but it's an interesting story of how sometimes, the most advanced technology in the world can undermine your efforts - imagine, a swimmer sunk by a "leak"! Or should that be a speedboat? Thanks to all who have commented on yesterday's post, which focused mainly on the newly developed swimsuit by Speedo, the LZR Racer. This suit is making waves in the swimming world, since it has been worn for 9 out of 9 world records in the pool this year! Some coaches believe the issue of fairness needs to be debated, with calls for ethics debates around it. In rowing we also have an interaction with water and this aspect of the technique/training generally has a bigger impact than the physiology. FISA (our international federation) dealt with similar issues as swimming is going through in the 70's and 80's when some countries started using riblets running the length of the boats hull and also applied what was called "fish slime" which changed the properties of the hull/water interface and made significant difference in time (10 sec in a 6 min race). 1.4 No substances or structures (including riblets) capable of modifying the natural properties of water or of the boundary layer of the hull/water interface shall be used. It would seem that the claims of Speedo/NASA indicate that with the new suits this boundary layer between the body/suit and the water is definitely modified. Whether FINA consider this unfair or not will be the deciding factor in the debate. In addition, as I began writing the post yesterday, I contacted Prof Raul Arellano, who is based at the University of Granada in Spain. Arellano has spent years studying fluid movements during swimming, and has published numerous papers looking at propulsion and biomechanics of swimming, so he contributes to the specific debate around swimming with a far more experienced and educated eye than I can! And his input is very interesting. I've pasted some of his response below, with my comments immediately following them. The problem with the new swimsuits is that they improve the body shape much more than skin friction. And this improvement is very individual... the percentage improvement depends on the person's body shape. I have observed a master swimmer with a lot of fat around her abdominals reduce her time in 100m butterfly by 6 seconds to break the Master's world record. The changes in the body shape underwater using a smaller size full body swimsuit were clearly evident (the fat position was fixed and the perimeter reduced). In yesterday's post, and in the news reports, a great deal was made of the reduced drag as a result of the LZR suit being seamless and consisting of new materials tested by NASA. This insight suggests that in fact, the suit's ability to reduce friction and drag may be minor compared to the improvement in body shape as a result of wearing the swimsuit. Is this analogous to the compression garments now being touted for team sports and explosive sport in particular? That came up in one of the comments to the previous post - of course, the effect would be substantially larger in the water, and the mechanism is different, but it's still intriguing. These changes [in performance] are much smaller in well trained top athletes, but enough to improve the performance some tenths of second. But you need to add some more things related to HiTech doping; for example, is the use of biomechanics HighTech doping? This tool is far less accessible than a swimsuit and so very few swimming teams use this kind of enhancing tool. We have observed changes in the start technique, changes in the underwater phase of the start and turns, changes in the stroke synchronization, changes in the body position, and so on. In our experience testing top level swimmers at the end of one feedback and training workout to improve the swimming start, we obtained improvements of half a second in the 10m start time. Is this improvement doping? You can see the videos of Olympic champions during Munich 1972 or Seoul 1998 and you can observe very bad start and turn techniques, these changes can affect to the top performers much more than the use of new swimsuits. For example, if you observe Michael Phelps' start and turns, he can obtain more than two seconds' advantage in 400m IM. The rest of competitors and their coaches can use the same turn technique as Phelps but they don't ? Why? ...Who knows? Why leave any stone unturned? In any event, one thing that never ceases to amaze me is that there are, as Prof Arellano has pointed out, world class athletes who miss out on opportunities for improvement that they could use to gain seconds on their performance. And who knows why they would not? The case of the Speedo LZR once again highlights the fact that there are people who naturally embrace technology and innovation, and some who do not (or cannot, as the case may be). I know if I was swimming, I'd be embracing every single opportunity for improvement, even if it was unproven! At least I can observe clearly some technical aspects improved by some record holders before their impressive performances. Bernard, for his 50m and 100 m World record, significantly improved his start technique, getting the 1st place immediately from the start (this point improved more than half a second [from his France record in 100m free performed last season in France]. This is critical to be winner in the 50m or 100m events, where the waves generated by the rest of competitors can affect you in a magnitude (increasing your total drag) that is impossible to overcome keep up with the more quicker starters. You do not have enough energy to surpass the increased wave drag. Interesting then that training, even in the day and age of superior technology can still make such a large difference. 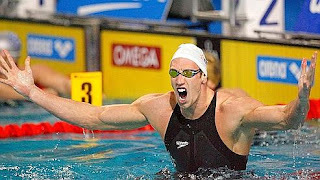 I recall that Roland Schoeman, South Africa's best swimmer at the Athens Olympics, stood out for his incredibly fast starts, that often had him a body length clear within the first 30 m of a 100m freestyle event. I find it astonishing that the other seven guys in the Olympic Final could be that comprehensively "outstarted", considering the importance of that aspect of the race. There are analogies and comparisons with many sports; I can think of a few cases where athletes have made very basic errors in preparation that would be easily resolved through simply listening. And so like Prof Arellano, I have no answer for why more athletes would not develop these obviously crucial areas a little more than they have, and work on technique when it's apparently available to those who really want it. I suspect that part of the problem is that elite atheltes (and their management team) become quite insulated from the "voices" beneath them. And so they fail to hear or listen to anyone but the select few in direct contact with them. Thus, they often won't even perceive the possible benefits they might gain simply by listening to others. Regardless, the swimsuit debate rages on, with a discussion between FINA and Speedo scheduled for the World Short Course Championships in a few weeks. Difficult to see how anything can be done now, unless they're prepared to scrap the world records set so far this year? That's it for the swimming for now - thanks to all who have commented and written in, feel free to throw your hat in the ring on this latest one. But speaking of technique, it's back to running tomorrow, when I'll take a look at running technique, and specifically, the landing of the foot. Should you land on the forefoot? Or is heel striking the better option? We'll have a crack at that then. As for the rest of the week, a big event on the weekend - World Cross Country championships in Edinburgh. The first big Championship clash of the year between Kenenisa Bekele and Zersenay Tadese. I'm sure that will warrant a post or two! But for tomorrow, it's foot strike in running. Join us then! Speedo's LZR: The role of swimming technique in progress - the suit or the style? Adidas launches its swimsuit: Are we watching swimmers or "human-powered boats"? 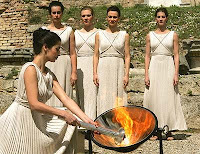 Olympia was today the site of one sport's most fascinating and ancient traditions, the lighting of the Olympic flame. Dating back to the Ancient Olympics, where a flame was kept burning during the course of the Games, the current tradition of the lighting of the Olympic flame was re-introduced for the 1928 Games of Amsterdam. The actual process of lighting the torch is remarkable - the sun's rays are concentrated by a parabolic mirror (right), during a ceremony performed by eleven women representing priestesses. This followed by an elaborate ceremony that ultimately lights the official Olympic torch. A short (4 minutes) highlight video of some moments from the ceremony is shown below, for those wishing to view it (I apologize for the music in the background - not my choice! You might want to go with your imagination and watch with the sound off...!). Following the lighting of the torch, the journey begins, with a torch relay that crosses, in this case, 20 different countries before arriving in Beijing at the climax of the Olympic Opening Ceremony later this year. The first torch bearer this year was Alexandros Nikolaidis, Greece's Taekwondo silver medallist from the Athens Games four years ago. He begins a relay consisting of thousands of carriers, ultimately ending in a yet-unknown final carrier who will light the Olympic flame in Beijing's Olympic stadium on August 8. Controversy from start to finish - will the Olympics be remembered for controversy? The Beijing Olympic torch relay may well turn out to be the most controversial one in history. Ironically, the concept of the torch relay has political origins, having begun in 1936 when the Berlin Games Organizing Committee conceived the idea as a means of glorifying the Third Reich. For China, however, the opposite may be true, with protests and potentially violent demonstrations against China's controversial human rights record set to shadow the torch on its 5 month long journey. Those demonstrations began today, even before the flame had been lit, as the ceremony was disrupted by protestors who managed to unfurl a banner protesting the current situation in Tibet. This is happening amidst growing concern within the journalistic world that freedom of press is going to be non-existent in China - the latest story suggests that China will ban outside broadcasts from Tiananmen Square during the Games, out of fear that the visuals beamed across the world will highlight China's alleged human rights violations. However, these stories are inevitable (which may be a good or a bad thing, depending on your perspective), and the news media will bring you all you need to know, as well as things you didn't, in the buildup to Beijing. And besides, this is the Science of Sport, not the politics, so we'll turn instead to a Beijing-related story of another kind - Speedo's Super Swimsuit and the "waves" it is causing! In recent weeks, we've focused on the possible impact of Beijing's pollution on endurance performance. That debate has a long way to run, and I'm sure that as we get closer to August, it will feature again. But for today, it's performances in the swimming pool that dominate and in particular, the impact of a new swimsuit by Speedo on performance. I was sent this article by a colleague in the USA this morning, and I must confess I had missed this fascinating story of how a new swimsuit threatens to move the sport forward by seconds in the next few months. Speedo's LZR racer swimsuit, developed earlier this year, is the common denominator in all NINE world record performances in the pool so far this year! Most recently, Alain Bernard, a French freestyle swimmer (shown right), broke both the 50m and 100m freestyle world records during the European Championships. This flurry of world records has driven a lively debate, which even seems to be polarizing former swimmers, administrators and coaches of the elite athletes who stand to benefit through the use of the swimsuit. For example, Mark Schubert, who is the head coach of the US swimming team, has predicted that this kind of technological advancement will one day render world records "irrelevant". The French swimming technical director has called for an ethical debate on the swimsuits, despite the fact that one of his men, Bernard, is a big "winner" as a result of the suit. The Australian head coach, Alan Thompson, sits in the opposite corner, saying that he has no issue with the suits. He is supported by a number of former swimmers, who acknowledge that the suit is definitely a major contributing factor to performance, while at the same time suggesting that it's merely the price of progress and that we should not resist the inevitable change. For every person who supports innovation in sport, you will find another who warns against the potentially rampant effects of technology on performance. What is the deal with the suit? How does it work? A tighter, corset-like midsection that is reported to reduce fatigue at the end of races. I can't vouch for any of these claims, and I'll wait on the feedback from an expert before commenting. One sure way to test the first claim is to look at how races are paced, however. Pacing strategies, as I'll describe in our upcoming series on Fatigue and performance (starting next week), are of crucial physiological performance, and if the suit works, then you'll find that world records will be set with SLOWER starts and FASTER finishes. As for the other two innovations, I won't argue with a team of scientists from NASA, who reportedly developed the suit. But now for the more intersting question: Should this be allowed? The issue of technology in sport has come up before, most notably with the debate around Oscar Pistorius, though that is a little different, being an advantage that others cannot copy. In this instance, access to the new equipment and technology is a little easier, provided you can afford to pay $700 (or $325, or R5200) for the suit, you too can benefit from it (research and development from NASA clearly does not come cheap!) However, it's still within reach of most competitive swimming nations, particularly if it's the small price to pay for Olympic success. Seriously though, the debate is a very tricky one, because as the Australian head coach points out, "We can't still be swimming in wool suits". No, we can't. Yet the situation we now find ourselves in poses some challenging questions, hence the call from the French technical director for an ethical debate. I'll stop short of professing anything dogmatic here, but I will say that I personally think it something of a shame that a world record, the fastest performance ever by a human being, can be achieved without training harder or smarter. In other words, there are swimmers in 2008 with exactly the same level of performance ability as they had in 2007, yet they will be seconds faster in some cases. One Australian swimmer claims a six-second improvement in performance in a 400m medley. How much of that is training and hard work? How much is the suit? Three seconds each, perhaps? Six and none? Who knows, and that's difficult to get around. In a sport where 1 second is the difference between first and eighth, the impact of technology on the outcome can't be ignored. Of course, progress is natural, and some may be thinking this is a futile argument. Perhaps it is. We could very well start debating whether athletes from the 1950's were better than those from the 2000's. The best one could do with that debate is a "peaceful disagreement". But when the technology makes such an obvious difference, in so short a time, then I do believe it's a relevant one. In 2007, pre-Speedo's LZR Racer and NASA testing, would Alain Bernard be a world record breaker? Perhaps. And perhaps in Beijing, he'll prove it by beating other swimmers in the same equipment. And therein lies the crux - provided the same equipment is made available to all swimmers, the argument never moves beyond world records. Because then, ultimately, it's still man on man, woman vs. woman. And the best swimmer wins. But if, as is possible according to reports, some have access and others do not, then the level playing field that is required no longer exists, and that is a problem. The same argument and head-crunching debate exists for just about any sport - cycling, yachting, motorsport - may the best equipment win. The alternative, the Ancient Olympics where competitors took part sans clothing, is the other extreme, and probably not a viable one! The other problem is whether or not FINA, swimming's governing body, can regulate equipment. Again, I won't profess to know enough to even answer this question. Certainly, in cycling, it's possible, though complicated, to regulate equipment (weights, dimensions, ratios, shape etc.). Similarly, it's easy enough for athletics to regulate javelins (mass, centre of mass, etc. ), but whether this can be done for swimsuits, I don't know. As one commentor has noted below, authorities meet regularly to discuss new equipment, as they will in this instance, at the World Short Course championships in Manchester. At that meeting, FINA will meet with Speedo, though at this stage, it's difficult to know if anything can be changed. The suit is legal, and to suddenly scrap performances would cause some controversy. "Techno-doping" - an issue for WADA? Earlier this evening, I was reminded by Jim Ferstle, a reader of the site and journalist who often sends interesting articles this way (including the Speedo debate), that WADA, who everyone knows as anti-doping watchdog, tried a few years ago to ban altitude tents, on the grounds that they provided an unnatural advantage similar to doping. Fortunately, that effort fizzled, but it does seem that this is one where they may well have more of a role to play. Is this an example of "techno-doping", with devices having no purpose other than to enhance performance? Should they be banned? Does technology unbalance the playing field? Do athletes gain unfair advantages from technology? At what point does innovation become "unnatural" and discriminatory? All questions for which I don't have a conclusive answer. Your thoughts are welcome on the topic, please let us know! A rather "South African-centric" post today, but for those outside SA, please do read on, or bear with me for the post focusing on one of South Africa's biggest road races - The Two Oceans Ultramarathon (and Half-marathon). This is a race that few outside of SA will likely have heard of, but it's one of the big 2 ultra-marathons in South Africa, along with the 89km Comrades in June. The race, a 56km cruise around the Cape Peninsula, is without doubt one of the more beautiful races in the world, and if you're reading this from outside SA, and feel inclined to take a "running holiday" in the future, next year in April is a good bet - you won't be disappointed, either by the race or by Cape Town! There is also a half marathon, for those interested in the shorter races. The race profile, incidentally is shown below - a tough final 28km, the marathon mark falling in the middle of the most challenging climb of the race, with another 14km to go. Most of the runners who've actually completed the race will only read this on Tuesday, after returning to work after the weekend, and so their legs will testify to the toughness of the final few kilometers! Well done, and take a few days off! But the main focus of the post today is the Two Oceans expo - as with many big races, the three days leading up to the race involve an expo where all the 'players' in the running industry get to show their wares and promote their goods. Think running shoes, clothing, gels, sports drinks and other gadgets and "necessities" for runners. I was at the Two Oceans Expo for the last three days, and given our recent series on running shoes, it was a first hand tour through the technology. So I thought I'd share some insights and thoughts. Over the last few days, we've done a series looking at running shoes and the possibility that the expensive shoes you were fitted out in might actually be the cause of the injury, and not the solution! And the response has been fantastic - we've received many comments and emails from people, supporting, refuting and discussing the topics, and so it's quite clear that shoes, more than any other topic, touches runners where it counts - their feet! And, unfortunately, their wallets, for it's still the largest expense a runner incurs for the sport. So it's not surprising that when 20,000 runners gather for a serious running event, the shoes take centre-stage. I was fortunate enough to wander around and interact with various shoe companies, and have their sales and technical staff explain to me the latest innovations and gadgets that are "guaranteed to make me faster, and injury-free". What is particularly interesting, given the context of our series on shoes over the last week, is that every year, it becomes clearer and clearer that the market is heading towards a neutral, cushioned shoe focus. The major brands still have their heavy, expensive motion-control shoes, but the trend is without a doubt towards the lighter and more cushioned shoe. I remember a time when the default option was to suggest that the runner get an anti-pronation shoe, simply because they pronated. Remember, pronation is the "normal" movement of the foot - almost everyone has it. But as recently as perhaps 4 or 5 years ago, it was the enemy, and advice was given to stop it at all costs. That is no longer happening, as far as I can tell. Again, there are brands that still make shoes to stop the movement, but they now seem to be out-numbered by the cushioned shoes, and the default advice that most people are getting is "go neutral". Every company - Adidas, Nike, New Balance, Asics, and Puma (at this particular Expo, that is), has developed some device to mimic or simulate "barefoot" running. Whether it be a flexible shaft in the shoe, or a plate that rotates on the heel, or even the more breathable design, the very obvious trend is towards more movement, more natural, more barefoot. As we said in our last post, the companies are trying to sell "barefoot". And that is encouraging, and I'd love to know the rationale and forces driving that shift. The other really interesting thing that was pointed out to me a few days ago by one of our readers is that about 10 years ago, Adidas came up with a "Feet you wear" campaign. Some may remember that - the logo was a foot that had 'evolved' into the shape of a smiling face. The concept back then was to mimic barefoot running, bring the foot closer to the ground, and let your feet decide, they knew best, and so on. That idea then disappeared, but it's the earliest efforts I can recall of a company going that way, even preceding the Free concept by Nike. What is interesting is why that campaign did not take off, and why this current trend might be different? Was that particular shoe range inferior for some other reason? Perhaps the scientific evidence, and the support given to this concept by "experts" in the field, like physios and podiatrists who may be advocating neutral shoes is different now, compared to the late 1990's? Again, it's speculation, though I suspect that industry insiders know this. Expanding from shoes, and looking at the running industry as a whole, what tends to happen at these expos is that everyone abandons scientific integrity (if there was any to begin with!) in order to sell product. And it's astonishing, and often humorous to observe how it is done. Products are being peddled left, right and centre, with little regard for facts. Some of the advice being given runners is frankly shameful. At least one runner, who was standing next to me at a product stand, is going to run the 56km race drinking a protein shake to "take away lactic acid and stop the muscle from being broken down". Anyone who has ever eaten a high protein meal before, or during exercise, will know just how badly this can affect your stomach - I hope he abandons this strategy before stomach problems end his race! Of course, runners can often be an adventurous bunch, willing to try new things and experiment, often to their detriment. In the last three years, I have been in the medical tent of the Comrades Ultra marathon doing research, and every year, three or four people have to receive medical treatment because they tried a new product on race day and had a negative reaction to it! Some of the products being sold, and the rationale behind them, is just astonishing. For example, you can buy a cream in South Africa, which you rub on your legs in order to "remove lactic acid from the muscles". It's anyone's guess how it works. Never mind the fact that the lactate (or lactic acid, as it is often incorrectly called) is unlikely to really be the problem for an ultra-marathon runner. I once asked one of the technical consultants to explain how it worked. The answer was that "The cream contains oxygen, which diffuses through the skin, into the muscle and then takes out the lactic acid". While this is clearly ridiculous, where it becomes more disturbing is that this product is backed and endorsed by a local University, reasoning and all! As we have seen before, when the price is right, science can say pretty much whatever it needs to! (I'm thankful to say it's not my University!) I suspect that where ever you are in the world, you'll be able to relate similar stories and products. Knowledge is power. The market has the power, what of the knowledge? And I make these points and give these examples, not to slam the industry or those in it, because they are trying to survive and gain a competitive edge - their incentive is not truth or validity in their claims. That's wrong, I know, but it's the way it is. So you cannot hold them accountable for the myths they perpetuate, unfortunately. Rather, I wish to point out that ultimately, the consequence of the sales-myths is that the athlete, or end-user is compromised, not the company. And as with shoes, you, the runner, should dictate the market by being discerning and severe on these kinds of products. Force the makers, and the scientists who say what they are asked to (this applies to other situations as well) into a higher standard of credibility and integrity. That, of course, requires knowledge, understanding, and education, which is why sports science, often undervalued, needs a boost in its public profile and perception. I was working at the Runners World stand at the Expo (I am the scientific editor of the SA mag), and people were invited to come and ask questions - none did, and I suspect they do not perceive that there are things they might benefit from knowing. Injury? Ask a physio. Illness? Ask a doctor. But what does one as a sports scientist? Hypothetically, the issue of oxygen diffusing through skin would be one such question! This is also not to say that suddenly the "exalted" field of sports science has all the answers, for clearly it doesn't (and nor do I). But the contrast between what is perpetuated at events like the Expo and the facts is so large, that everyone can contribute to better understanding. And hopefully, fewer people will run marathons drinking protein shakes as a result! Also, what this does is introduce some really interesting discussion points, and so I did, at the very least, leave the Two Oceans expo with some ideas for articles in the future, and with a greater appreciation of where the various sections of the running world (running shoes, energy products, creams, recovery aids etc.) are heading. I also left with a few other stories and discussion points from chatting to coaches and runners, but that is a topic for tomorrow's post. To all those runners who are taking part tomorrow, good luck! And to all those who read this AFTER taking part, congratulations! For those not lucky enough to be in Cape Town for the weekend, wherever you are, have a wonderful Easter weekend, and perhaps next year, I'll see you at the Expo! Well, it's been a week and a half, and an interruption of our series on Running Shoes thanks to Gebrselassie's announcements, but I have finally managed to get back to the topic that had caused so much debate and discussion: What is the value of running shoes? Do they cause more problems than they fix, and what is the future of the running shoe industry? One argument that has been put forward a great deal is that barefoot running is the way to go. Apart from the obvious practical concerns - glass, stones and other objects not meant to be run on by 'soft' feet - I'm not 100% convinced that the knee-jerk reaction in the opposite direction is the way to go either. I know podiatrists who are of the opinion that the sole function of the shoe should be to protect the sole of the foot, which is in line with what we've been discussing, but a more extreme argument. I'm sure there's merit in that argument, but I wouldn't dare suggest that any reader of this post suddenly switch to barefoot running, or even to lightweight trainers if they've always worn more supportive motion-control shoes - remember, the key to successful training is managing change, and physiologically, you'll pay a hefty price if you make a drastic change like this. Instead, the objective should be to manage the change, aiming to gradually move away from the bulky shoes and into the well-cushioned one. This requires changes in training, possibly strengthening exercises to correct weaknesses and imbalances that predispose to injury, and then the new shoe should work. However, the debate between barefoot and shoes is nevertheless interesting, so a few interesting discussion points that arise are considered below. You have no doubt heard, read or experienced that one of the main differences between running in shoes and running barefoot is that when you run barefoot, you tend to land more on the front part of the foot. In contrast, pull on a pair of shoes and you'll land more on the heel. There are of course other differences - barefoot running tends to have a shorter contact time, a shorter flight time, lower impact forces and higher muscle activation in the calf muscles just before landing. You also land with your ankle more "pointed" (called plantar flexion) as opposed to dorsiflexed, or pulled back towards you. But the argument around landing on the heel vs. ball for shoes and barefoot running is one of the more common ones, and certainly less technical! Therefore, landing on the forefoot is "natural" and good, but landing on the heel is unnatural and thus bad. Why does the body allow the landing to change simply by pulling on a pair of shoes? Or, looked at differently, if you take off your shoes, why do you suddenly land on the ball of the foot? The answer to this question must be that when you take your shoes off, your body is "intelligent" enough to adjust your landing in order to reduce the loading force and rate. The change in biomechanics thus serves a useful purpose! This is a conclusion made in many studies. For example: "...barefoot running leads to a reduction of impact peak in order to reduce the high mechanical stress occurring during repetitive steps" (Divert et al. Int J Sports Med 2005). This reduction is achieved in part by changing muscle activation (which we'll come back to), as well as altering the biomechanics slightly as described above - lower flight, different ankle position on landing and so forth. The end result is that you land more on the ball of the foot. Of course, what people often forget is that if it works this way - taking shoes off - then surely it must work the other way, when you put the shoes on? In other words, when you run in shoes, your body is "intelligent" enough to recognize the added cushioning, and so it allows you to land on the heel. There's no reason to suggest this is bad, but applying the same logic used above, it might actually be a beneficial, positive response to wearing shoes - perhaps landing on the heel is the protective, optimized adjustment to running in shoes? It's never made a great deal of sense to me, but the key is, the body seems quite capable of changing mechanics and even muscle activation in order to reduce impact forces - and this introduces the concept of "muscle tuning". The concept of muscle tuning, proposed by Benno Nigg in Calgary, is both new and quite complex. And I'm certainly not a biomechanist, and so the detail and technical explanations are best left out of this discussion! But the concept has some quite important implications, which we'll get to. First of all though, muscle tuning is the adjustment of muscle activity in response to impact forces, and it ends up minimizing soft-tissue vibrations and joint-loading. Let's step back a little - when you are running, the muscle is activated BEFORE you land in order to prepare the joints and supporting structures for the impact. This muscle activity is called pre-activation and there's actually a good deal of evidence that suggests that performance is influenced by this pre-activation, since it helps to store up elastic energy and make running more efficient. The muscle is then active during the entire stride, after ground contact, to continue to support and control movement of joints. What Nigg found is that when you run in shoes with a softer or harder midsole, or run at different speeds, you change the impact forces, but the muscle activation simply compensates and you end up experiencing similar soft-tissue vibration. In other words, your body is "intelligent" enough to adjust muscle at different levels to ensure that you don't have excessive joint loading and tissue vibration. Where this becomes especially relevant is in the application of the theory to orthotics, running shoes, and other shoe inserts. Because this theory is saying that the muscle activity during running will increase as soon as the "preferred" movement is affected. The use of running shoes, for example, which may well alter the movement of joints during running (think anti-pronation shoes here), will then simply produce an increase in muscle activation which now stands to affect the body's "natural" mechanism to regulate joint-loading. So in effect, the problem with shoes, orthotics and inserts might actually be that they promote an increase in muscle activation, which prevents this "intelligence" from regulating the normal soft-tissue vibration. Nigg suggests that things like orthotics and shoes should reduce the muscle activation in order to be optimal, rather than increasing it by preventing normal movement. Quite how one establishes this outside of a specialized biomechanics lab is a tricky problem, but that's another matter. How much do all our interventions (and inventions) actually achieve? The point for the running shoe industry is to recognize that the best efforts of researchers, product developers and (we have to point out) marketing experts, may in fact be trivial by comparison with the remarkable ability of the human body to adapt and respond to "stress", whether that stress is changing running shoes or long term training. Of course, problems do develop and injuries do happen, and when they do, it's fascinating to wonder whether in fact the cause might be the change that we try to introduce to fix the problem! Is it possible that clever product development, based on theories and concepts, have actually forced the body into a "wrong" response that has increased injury risk in the long term? And is there a chance that if we just left physiology to its own devices, and managed every case individually, we'd be better off? So to continue the theme of the running shoe, the shift in the industry has without doubt been towards a more "natural" shoe. Of course, they can't sell "barefoot" (that's free! ), so the next best thing is to be barefoot in shoes, which is where it's going. Practically, however, the challenge for everyone is to manage that, and not simply leap from one extreme to the next, as mentioned above. That's it for shoes for a while, we'll no doubt come back to the topic in the future. But next on the agenda is a series on performance, the brain and pacing, which throws up some fascinating questions and hopefully discussion. So join us then! Just time for a very short post today (I promise I'll find time and tackle running shoes and barefoot running soon! ), and thanks to Lorenzo for providing the following link, which hints that Haile Gebrselassie may actually go back on his decision to pull out of the Olympic Marathon! "I do not want to rule anything out at this point," were his words. Now, I remember a previous occasion where Gebrselassie made similarly bizarre requests. The event was the IAAF World Championships in athletics, held in Seville, Spain, in 1999. Gebrselassie withdrew from the 10,000m event saying that the track surface was too hard to run long distance races on! There was talk at the time, if I remember correctly, that he actually asked the meeting organizers to pour water on the track just before the start, so that it could be softened! They refused (I suspect they knew that it wouldn't work, along with everyone else), and so he said he would not run. Eventually, he was "persuaded" to run by a combination of pressure from the Ethiopian federation, and I seem to recall that his shoe sponsor Adidas designed extra-cushioned spikes for him to run in! So perhaps this is all just the same thing, 11 years later. Or maybe it's Gebrselassie's rather unique sense of humour. Whatever the case, when I first read the announcement, I was quite sceptical that he'd actually go through and pull out. He may yet, but I wouldn't be that surprised if he changes his mind and lines up on the roads, even if it is inside the city centre! Just one more story I picked up on in the news in the last couple of days - apparently, in September last year (which is only a few weeks after the Olympics will end this year, so weather conditions are much more similar than for the Beijing Marathon in October), Beijing hosted a pre-Olympics Mountain Bike event, to serve as a trial run for the Games. Well, 50 cyclists started the race, and a grand total of.......EIGHT athletes managed to finish, most dropping out, in part due to oppressive heat, in part due to difficulty breathing! It's apparently difficult to differentiate between the two - very hot and humid air is certainly difficult to breathe (if you've ever been in a steam bath, you'll relate). And we received a great comment with some personal experience from Jamie, which you can read below in the Comments section - he was in Beijing last August for a test event on the rowing course. His report? Heat and humidity were significant factors, but the pollution not so noticeable. We've of course neglected to focus on the heat in the last few posts, courtesy of Gebrselassie's decision based on the pollution. But there's no question that the heat and humidity are going to be significant factors. If that's what Beijing has in store come August this year, then it's anyone's guess who'll win the endurance events. My money is still on an athlete who is based in the Far East - a Kenyan who lives and races there (think Wanjiru), or one of the locals, seems the best bet. But, in closing I do just have to add that I don't believe there is a long term danger of exposure to that pollution on a very short term basis. Gebrselassie has been quoted as saying that he fears for his long term health, and more recently, that "our [the athletes] safety has to be protected". I certainly believe the pollution will compromise performance, but the worst case scenario, in my estimation, is that an athlete will be unable to breathe, maybe feel nauseous and pull out of the race quite early on. But he'll live to fight another day, and no long term, residual effects will slow him/her down for years to come. So as I said previously, a short term negative effect, absolutely. But I don't buy this theory of long term damage - the exposure is just too short. Anyway, that's all on this issue, for now. I have a feeling that we'll be coming back to it again in the future. Oh, and last thing, as much as I would love to claim that Haile Gebrselassie is changing his mind as a result of reading this site, I can't bring myself to do that! Yesterday bought the sensational news that Haile Gebrselassie had made the "99% sure" decision to withdraw from the Olympic Marathon in Beijing and rather enter the 10,000m event. Gebrselassie is a great athlete, maybe the greatest ever, but this story has a bizarre sound to it. For one thing, to make a decision now based on a race he hopes to run in four years' time, when there's even less chance of being competitive (he'll be 39, at the end of a career that has lasted 19 years!) does not seem a very sound one. Secondly, it's highly unlikely that running the marathon in Beijing would affect his health in the long term. What it might do (and we'll get to this later) is affect his performance in the short term! That is, he might not have a very good race, perhaps, and worst case scenario, he'd be forced to bail from the race with breathing difficulties. But to suggest that his marathon running future is at stake is a little extreme. Performances in the Beijing Marathon - are they a guide to what we can expect? So, of interest is that despite not attracting a world class field of sub-2:07 men and 2:22 women, the times in Beijing (in October, at least) are quite decent - a 2:11:00 seems pedestrian compared to what we've seen in recent times in London, Berlin and Chicago, but it's by no means a disaster, particularly considering the relative weakness of the field. The worst performances in the last 12 years, incidentally, are more likely due to weak fields than any weather conditions, because in 2000, when the men were particularly slow, the women's winning time was 2:26, which is reasonable, and close to the overall average. Similarly, in 2006, when the women were slow, the men's race was won in 2:10:36, suggesting that conditions were not too hostile for fast times. I'm sure there's a lot left in this story, and certainly in the pollution in Beijing story. We'll follow its developments! Dramatic news being reported today by news sources is that Haile Gebrselassie, Ethiopia’s marathon world record holder and multiple world and Olympic champion has withdrawn from the Olympic Marathon in Beijing, citing concerns over the air pollution as the reason! "The pollution in China is a threat to my health and it would be difficult for me to run 42km in my current condition,"
“My current condition”, incidentally, refers to Gebrselassie’s asthma, which he says forced him out of the London Marathon in 2007. How bad is Beijing? And is this a justified decision? It is a radical decision to take, particularly with all of 150 days to go before the Olympic Games. Yes, there are concerns over the pollution, and yes, it's likely that conditions will be difficult in Beijing, heat and humidity adding to the problems. We won't go into huge detail on air pollution and exercise performance now, since we've looked at the pollution situation in Beijing in two previous posts. First, we discussed the likely problems the athletes will encounter in Beijing, and how some nations are planning to send athletes to locations OUTSIDE Beijing to avoid the pollution. That was amidst claims and promises that Beijing was doing all it could to improve the pollution situation. However, a few months later, it was being reported that the air pollution situation in Beijing was actually getting worse, with many of the promises about cleaning the air (including the closure of factories in Beijing) being forgotten or ignored in the face of economic pressure to keep factories open. It has been a problem that has plagued the build-up to Beijing since last year, and this is the most dramatic story arising out of the pollution controversy so far. But rather than make this decision now, why not wait out the next three or four months and see how things develop? Consult with an expert or two (because this is an issue where you'd get a sixth and seventh opinion IF you really wanted it) on asthma. Find experts on pollution, as Paula Radcliffe did, and see whether there is a contingency plan that might allow you to run and challenge for what is really the only major title or accolade you're still missing? The British Olympic team even announced that they would provide masks to their help their athletes breathe more easily if required. Perhaps Gebrselassie has done all this, and the advice he received is that there is no way he'll be able to run in Beijing. It's still almost unbelievable that he wouldn't wait out a month or two before announcing a decision that, in the words of his manager Jos Hermens, is "99% sure". For the reality is that Gebrselassie has achieved pretty much all he can in international running, apart from winning the Olympic Gold in the marathon. It's a goal he himself has expressed on many occasions and it really does seem peculiar to me that he could so easily let go of the goal. "He doesn't want to put his career in danger and he still wants to run at the 2012 Olympics in London. His dream is to run in two hours and three minutes and to be the first to do that. It's more important for him than to win another gold medal." Quite what the long term implication for his health is is difficult to know - certainly, his career would hardly seem in danger if he raced in Beijing. His marathon race, yes, but to suggest that his long term health would be affected is a little extreme. The worst that would happen would be that he could not breathe, and so he'd stop and pull out of the race within the first 10km, and live to fight another day - there's no reason to believe that his 2012 race is at stake thanks to the Beijing air of 2008. Then again, I'm not sure that elite athletes have ever been exposed to the kind of pollution they'll encounter in Beijing, so the Olympics will be interesting simply from that point of view. Perhaps Gebrselassie tried to jog on a recent trip to Beijing, and found that he simply could not breathe - his mind may have been made up by his lungs! However, it would seem to be a question of priorities, which is a deviation from the usual line given by athletes (including Gebrselassie) that the medals are more important than the records. Of course, it's Gebrselassie's choice, and good luck to him going for that 2:03 marathon (that is another issue altogether - we've discussed the chances of a 2:03 before). But it certainly is a shame, and hopefully, that 1% chance will still come into play and we'll see Gebrselassie on the roads, rather than the track, in Beijing. Suspicions and questions - a valid reason? Such is the climate around international sport these days, that there is already lively debate and cynicism about the given reason. Does Gebrselassie really have asthma? Or is this an excuse not to be tested by drug control authorities? The problem with that "conspiracy theory" is that Gebrselassie has announced that he'll try to run the 10,000m race in Beijing instead, where he'd be tested anyway. So scratch that theory off the list. There's actually a great deal of controversy around the drug testing issue and asthmatics, incidentally - for example, if you take an average sample of people and compare it to a sample of Olympic athletes, you find that often, the Olympic group will have a much higher incidence of "asthmatics" - if , that is, you choose to believe all the medical clearances that are issued giving them exemption to use inhalers (which are otherwise banned). But again, the fact that Gebrselassie is not pulling out of the Olympics, but just the Marathon, would suggest that the drug theory is slightly misplaced, on this occasion anyway. As for where this leaves the marathon, well, it's dramatically weakened by his absence. His anticipated race against the Kenyans, whoever they chose, was due to be a real highlight of the Beijing Games. The marathon will be somewhat lacking its lustre if indeed he doesn't change his mind. So a real shame for the Olympic Games, and let's hope that it's a premature decision and that he announces that he will, after all, take his place in the race come August. Running shoes: Solution or the problem?